Round Rock, Texas – January 27, 2105 – Dell today announced the newest version of its award-winning Dell KACE K1000 Systems Management Appliance, which includes new and enhanced functionality to further transform how organizations discover, configure, secure and manage computers and devices in multi-platform environments. Dell KACE K1000 version 6.3 features first-to-market systems management support of Chromebook, with seamless integration of inventory integrated directly into the K1000’s asset management, reporting and service desk capabilities. To help organizations address the surge of mobile devices, BYOD and Internet of Things (IoT) in the workplace, Dell Software sponsored a Dimensional Research survey in December 2014. More than 700 IT professionals worldwide assessed the biggest challenges companies face in managing a never-ending onslaught of network-connected devices. In addition to traditional computing devices, 96 percent of those surveyed had printing devices, 84 percent had mobile devices, 78 percent had telephonic devices and 53 percent had audio-visual devices connected to their networks. Nearly 90 percent of the respondents expect the total number or the total types of devices requiring management to increase in the next three years. More than half of the survey respondents had three or more systems management tools; 67 percent of those polled wanted to use fewer systems. Security, the ability to monitor device/application performance, and asset management were the top three concerns for addressing increased types and numbers of devices. More than 60 percent of the survey participants were sure, or suspected, that there were unknown devices or applications connected to their networks. The Dell KACE K1000 v6.3 helps customers clear major obstacles caused by the sharp rise in the number and types of devices connected to corporate networks. With Dell KACE, organizations can alleviate security and compliance concerns while replacing multiple point solutions or manual processes with a single appliance that automates and integrates critical systems management functionality. Integration of Chromebook data greatly simplifies daily administrative, security and systems management of Chrome devices. Agentless asset management of Windows systems enables companies to easily manage server hardware and software without worrying about agent-based performance concerns. Integrated server log monitoring offers greater oversight without requiring extensive training or special expertise. Greater visibility through enhanced agentless technology produces actionable insights into a broad spectrum of non-computer devices such as printers, projectors, network routers and switches—all from a single console. The Dell KACE K1000 v6.3 also streamlines patch management with real-time and roll-up status reporting. Additional enhancements include service desk improvements, greater integration with Dell Enterprise Mobility Management via single sign-on, and software asset management extensions for supporting more license types as well as an inventory of applications installed within Microsoft App-V.
Dell KACE K1000 v6.3 is available as a physical, virtual or hosted appliance. Dell KACE K1000 pricing is $8,900 for the physical or virtual appliance and 100 managed systems – computers or servers. The K1000 as a Service is available for $6.50 per managed computer per month. Existing Dell KACE K1000 customers can upgrade to the latest version at no additional cost. In addition to agentless technology, patching and service desk improvements, customers receive single sign-on capabilities with Dell Enterprise Mobility Management and one server monitoring license. An additional charge of $2,000 supports up to 200 licenses for server monitoring. The license cost for managing Chromebooks and non-computing devices is $1,250 for up to 250 devices. The Dell KACE K1000 is sold direct by Dell and through an extensive network of Dell certified channel partners. In December 2014, a global database of IT professionals was emailed an invitation to participate in an online survey on the topic of managing endpoints in changing IT environments. A total of 723 individuals completed the survey. Participants included a variety of stakeholders, including IT executives, managers, front-line IT professionals, and others representing a wide range of company sizes and industry verticals. The award-wining Dell KACE systems management appliances provide comprehensive, easy-to-use and affordable solutions for securing and maintaining critical IT assets. Only Dell ESM delivers endpoint systems management capabilities in an appliance-based architecture that simplifies deployment and ensures fast time to value. Dell KACE also provides best-of-class systems management capabilities as part of Dell’s Enterprise Mobility Managementsolution. For more information, visit www.dell.com/kace. 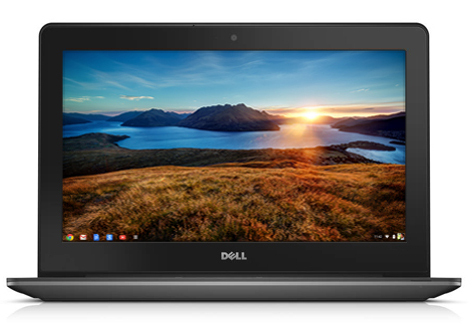 The Dell Chromebook 11 is an educational Chromebook, although, in my opinion, the Dell Chromebook 11 (11) is a Chromebook suitable for general use as well. At three pounds, its weight is in line with other Chromebooks. The 11 feels solid and good in my hands. It doesn’t feel cheap like some Chromebooks do. It feels more like a regular laptop than an inexpensive Ultraportable computer. The 11 sports the new 1.4GHz Intel 2995U Celeron Haswell processor (CPU) with 2MB of cache. For you less technical types, that’s all good stuff. Just think speed and low power usage. The memory is 4GB DDR3, which means you have plenty of memory (RAM) to handle a large number of Chrome browser tabs with ease. Primary Battery – Greater than 8 hrs. The two things that the 11 doesn’t have as features are a standard 15 pin video out interface and a standard wired Ethernet interface. They aren’t essential features, but they are nice-to-haves. In their place, the 11 has an HDMI interface and, of course, wireless networking. You could use a USB Ethernet connector in one of the 11’s two USB slots. Why it’s frugal: For $299, you get a fast, solid computer that will easily last you three to four years and possibly longer. 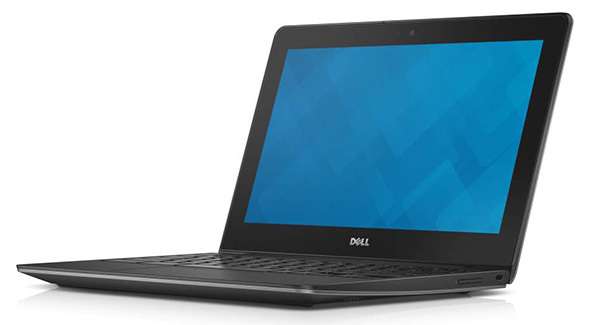 The Dell Chromebook 11 is well-built and features a lot of RAM for a Chromebook at 4GB, a 16GB disk, and a fast CPU. Unless the Chrome OS bloats drastically (not likely at all) within the next 4 years, you’ll have made a very wise computing investment. The Chromebook 11’s sound is clear and noise free. The camera is a front-facing 720p (YouTube quality HD) and is as good and clear as I’ve seen on any laptop–not just a Chromebook. Because this model is targeted toward students and education, I should note that the 11 feels sturdy enough to withstand being carried to and from school in a backpack without damage. And the battery has enough life in it to last an entire school day, if plugged in to charge overnight before the school day begins. It’s small enough and lightweight enough to fit into all but the smallest purse, messenger bag, or backpack. Students will love the “instant on” feature that places them at a login prompt upon opening the computer. Unless you really love trackpads, buy a wireless mouse for your Chromebook. You can buy small ones that are roughly half the size of a regular desktop mouse. The reason for the external mouse is that Chromebooks, including the 11, leave out essential mouse buttons from the trackpad. To right click, you have to press the ALT key while tapping the trackpad. A minor annoyance, but still an annoyance. The only major drawback to the Chromebook 11 is that it only has two USB slots and they’re both located on the left side of the computer. They’re both next to the HDMI slot, which makes using external HDMI video and two USB devices somewhat cumbersome or impossible, depending on the USB connector widths. I like the Dell Chromebook 11. What’s not to like? It’s a fast and furious Chromebook with a bright, clear screen that would be perfect for students and just about anyone else regardless of learning status. It’s a good value and you won’t be disappointed with its performance, styling, or durability. Recommendation: Buy it for a student, for yourself, or for anyone.